The following group types are not accepted by this hostel: Holiday with Friends, Junior / Primary School, High / Secondary School, College / University, Business Trip, Stag/Hen/Bachelor Party, Cultural Group If you have misrepresented the type of group you are booking for, your booking may be cancelled by the hostel." 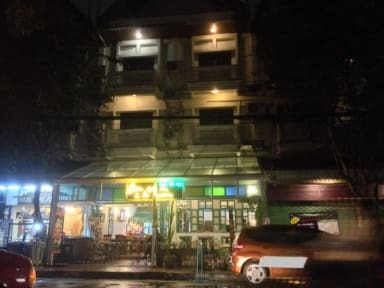 Located within the city walls of historic old town Chiang Mai, the Queen Victoria is a pub/restaurant offering great value food, drink and accommodation. Naturally we're biased, but we genuinely believe that our 8 superbly appointed rooms offer some of the best value-for-money accommodation in Chiang Mai. 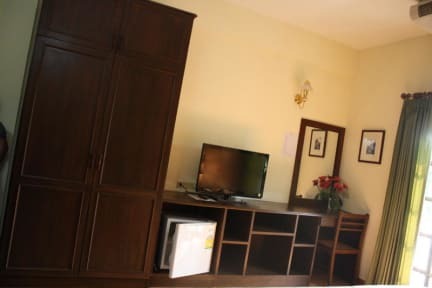 All rooms have air-conditioning, wi-fi, ceiling fan, hot-water shower, balcony, TV and DVD player. Please note we charge on a per room basis. Price for a standard room is 650 Baht per night and for the larger deluxe room it is 800 Baht per night. Our comprehensive menu features Western and Thai favourites together with an extensive choice of beers, wines and spirits. We pride ourselves on our hospitality, so whether you are looking for a room in Chiang Mai or just somewhere to relax and enjoy some food and drink, come along to see us at the Queen Victoria. Very clean and neat private rooms. The only downsides were - sometimes the water didn't work and there was construction right next door that would start in the morning. It wasn't a very social atmosphere, but good for couples or friends looking to stay in a private room right inside the Old City. I stayed in an ensuite double which was very large, clean and comfortable with working air conditioning. I messed up the booking dates and even though it was entirely my fault they were very understanding and accommodating and found a room for me. The staff were friendly and I ate good food in the restaurant downstairs. The location on the edge of the old town meant it was very easy to reach many of the cafes, restaurants and temples. Room was spacious with a safe in the room. Bathroom was interesting - shower just coming out of the wall in the middle of the bathroom - so anything you keep in there will get wet. You enter the hostel through a restaurant on the ground floor, but that was fine. Staff were very friendly and helpful. If you are looking for a guesthouse / quiet private room with en-suite then we recommend. Only complaints no converter and not much hot water. Otherwise, very good. Nice big room. Fan as well as air con. Handy location for sunday walking street, and for evening food stalls.